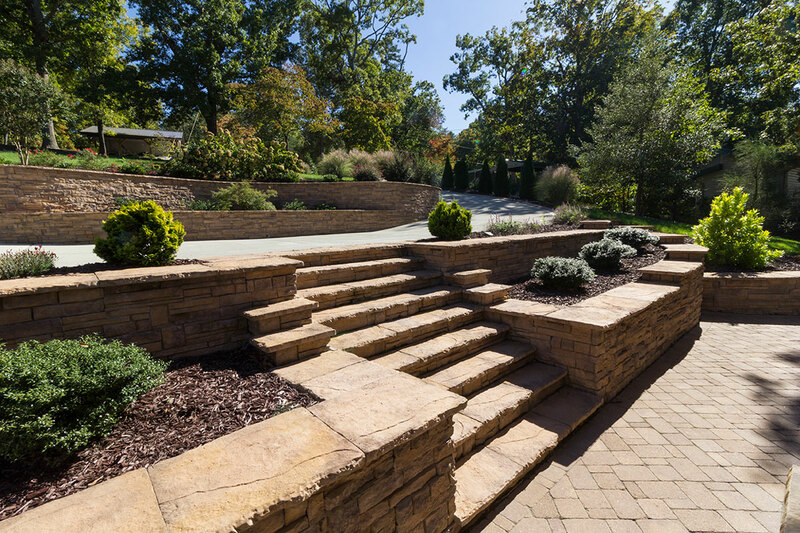 If you’re wanting to give a more “custom” feel to designs when you’re presenting landscaping plans to your customers, consider building stairs into your retaining wall design. Installing landscape stairs will go a long way toward increasing the usability of the yard while adding an attractive element of expression in an outdoor space. The Heritage Block retaining wall system offers a variety of creative options for you to build beautiful and natural-looking stairways. Stairs can be comprised of straight lines or flowing curves, depending on the landscape you’re working with and the end result you desire. Stairs with a curve look more natural, like a part of the existing landscaping. Straight stairs are more traditional but will take more time to build. So, if the rise of your slope is 54 inches, you will divide that by 6. You will need to prepare to build 9 steps. On steep slopes, this is a very important number. You will need to keep the blocks tight together to keep them from slipping. With a gentler slope, this number is less important. Added pavers and other materials can increase the depth of the tread and length of the run. Landings can even be added as a way to tie together two sets of steps. Building stairs with the Heritage Block system is just as easy as building a retaining wall. It all begins with excavating the area. Once the number of steps has been determined, excavate the area where you will be installing the stairs, based on the rise and the run. Helpful hint: Find the center of the stairway and mark it where the base stair will be placed. From the center mark you’ve made, mark the remainder of the stairs and remove the soil to meet base material requirements. After the excavation, prepare the base and base course as you would for a typical segmented retaining wall. Compact the base trench, making a minimum of two passes with a compactor. Helpful hint: If organic or wet soils are found in the base trench, remove them and replace them with granular material. Place a minimum of 6 inches of wall rock in the base trench and rake smooth before making at least two passes with a compactor. Check if level, and adjust as needed. If a drain pipe is necessary, continue the placement of the pipe in the trench for the base course. Install your first course of block below the finished grade near the front of the trench in an alternating pattern: 16 inches, 24 inches, 16, 24… Be sure to level in both directions and stagger vertical seams. Filling in the area with on-site soils can keep the base course blocks from shifting while filling and compacting. Fill the hollow cores and behind the blocks with impervious fill, and compact up to lower finish grade. Use infill or other approved on-site soils to fill in any additional areas behind the wall rock. The stair tread area must be level with the top of the base course of block.Then make at least two passes with a plate compactor. Measure the distance for the placement of the first stair riser, making sure that the blocks are sitting parallel with the base course. Place your blocks on top of the compacted area, allowing for 6 inches of wall rock to be added behind the blocks. For best results, place a block on the wall as a reference point, building out and leveling from there. To begin a curve from this point, place them close together, possibly cutting the block as needed, to follow the layout of the approved plans. Backfill the area, making sure to fill the area in front of the first stair riser with a small amount of impervious fill. Then, compact and level the rocks as previously done. Repeat these steps for each stair riser. Once all the steps are in place, install the selected stair tread material to finish your stairway. Options can include capstones, concrete or pavers—whatever you think will complete your project best!